With Kegco's Deluxe Two Keg Tower Kegerator Conversion Kit, you can transform a plain compact refrigerator or chest freezer into your very own draft beer dispenser, complete with a 3" diameter stainless steel draft tower with two faucets and plenty of exciting professional-level features that allow you to enjoy your favorite cold beverage with ease! 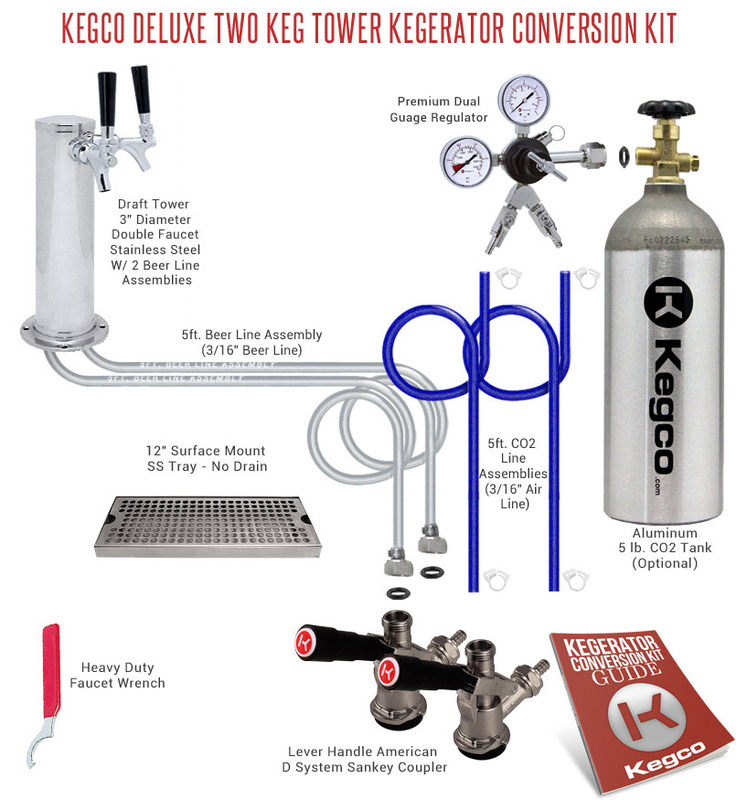 Drawing on years of beer dispensing experience, Kegco has designed a conversion kit that includes all of the high quality commercial-grade parts you'll need, from the NSF approved American D-System keg couplers to the durable commercial grade double gauge regulator. We've even included a stainless steel drip tray to contain any drips or spills, so clean-up is a breeze! This kit has been designed to dispense two separate kegs, and can run 2 full size kegs, 2 pony kegs, 2 six gallon kegs, or any combination of kegs, depending on your refrigerator's capacity. This NSF approved 3-1/2 diameter air-cooled stainless steel draft beer tower with two chrome-plated brass faucets is an excellent choice for two product draft beer dispense systems! It comes complete with two NSF Approved chrome plated metal faucets with brass levers and two black ABS plastic faucet knobs. Two 5' lengths of 3/16" I.D. beer line extend from the bottom of the tower. The thermoplastic vinyl beer hose reliably meets all of the demands for beer dispensing systems. It remains flexible and durable at recommended temperatures and pressures, is unaffected by normal cleaning compounds, and will not rot, swell, or dry out. Comments: I like the conversion kit. It was easy to install but it did not come with instructions. Presently, I am working on getting the regulator adjusted so i do not get a ton of foamy beer. It seems a bit difficult trying to come to a happy medium using two kegs. I give it some more time.